Over 1200 volunteer hours for the year bringing the total over 11,000 in 4 years. 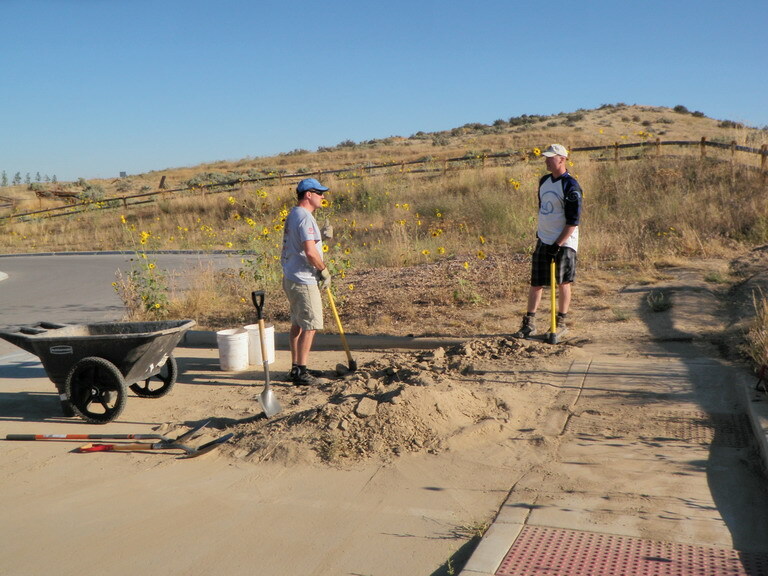 Volunteer work consisted of repair, improvement, erosion control, and week control on multi-use and downhill bike trails at the park. 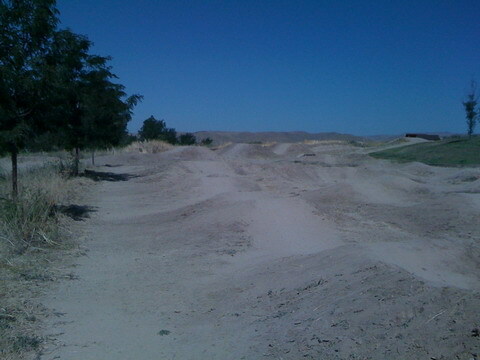 Complete a lease with the county that extends the city’s lease to include all trails at the park. 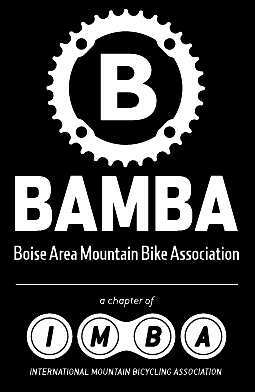 Complete a land use agreement with BAMBA to allow the organization to assist the city in maintenance of trails. Pay a landscaping company to spray herbicide in select areas to help control weeds on trails. 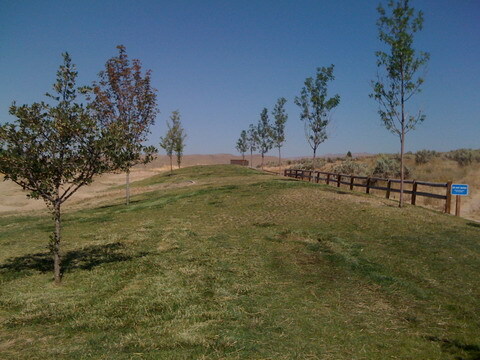 Pay a landscaping company to assist with weed control on trails. Despite the commitments from the city, none of the above four items were completed by the city. 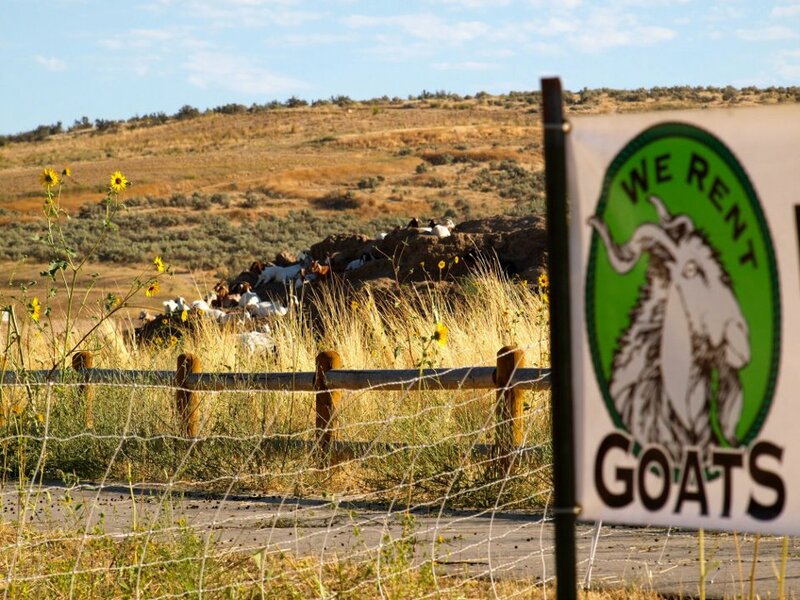 The city, however, did find $1300 within their budget to have goats eat weeds in a small section of the southwest corner of the park. The city also helped pay for fencing materials for one of the Eagle Scout projects. While the meeting with the mayor and city council was not scheduled until after 2012 budget negotiations had already been completed, BAMBA did have a chance to present the following ideas to them. While not enough to cover all the needs of the park, the city did say they would try to spend 1-2K for maintenance in 2012, which is a start. It would be great if the city approached the county to ask them to help provide funding for trails as well. As a comparison point, the trails in the Ridge to Rivers system are funded at ~$2200 per mile which is consistent with funding recommendations from the International Mountain Bicycling Association. 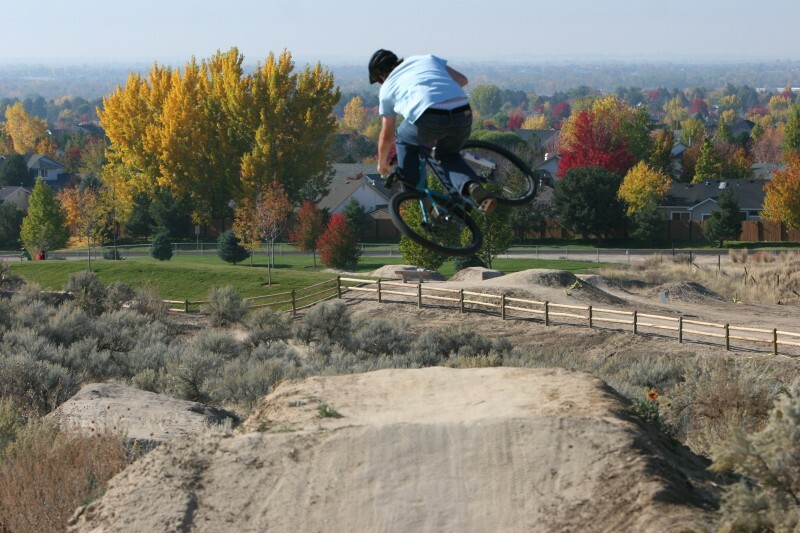 At $1-2K for 2012, the Eagle Bike Park trails maintenance budget is $80-$160 per mile. Elections for Mayor and City Council are being held November 8th, 2011. 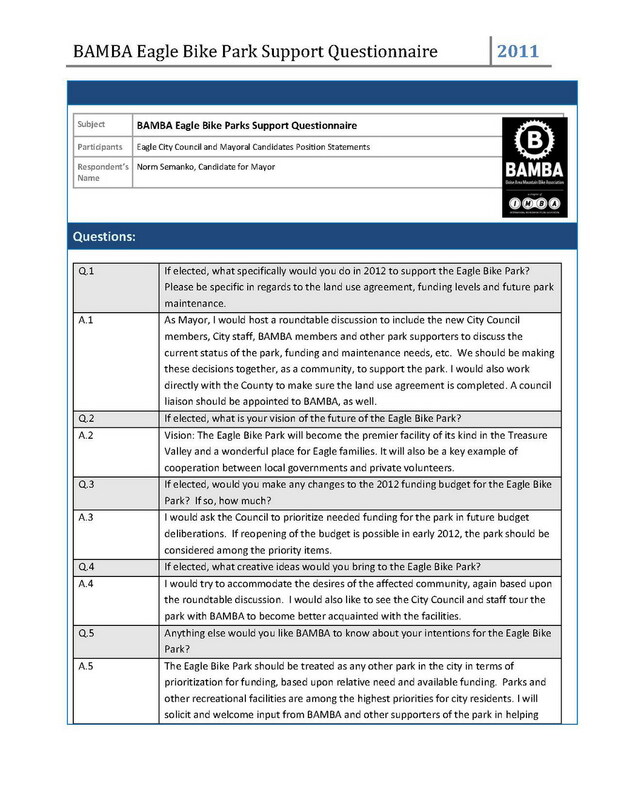 BAMBA has created a questionnaire for candidates of this election to determine their position on funding and support for the bike park. Following are the responses that have been obtained so far. 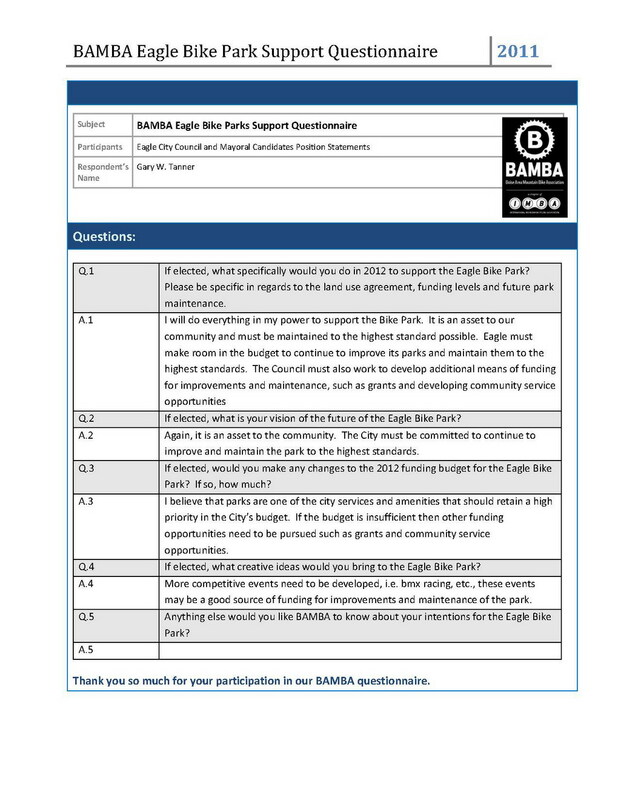 BAMBA encourages members of the community to get out and vote for candidates who are willing to support the continued success of, and proper funding for the Eagle Bike Park. Lots of trail maintenance been happening at Eagle Bike Park! August 10th an LDS youth group from the Eagle 6th Ward came out and performed trail maintenance at Eagle Bike Park (EBP). 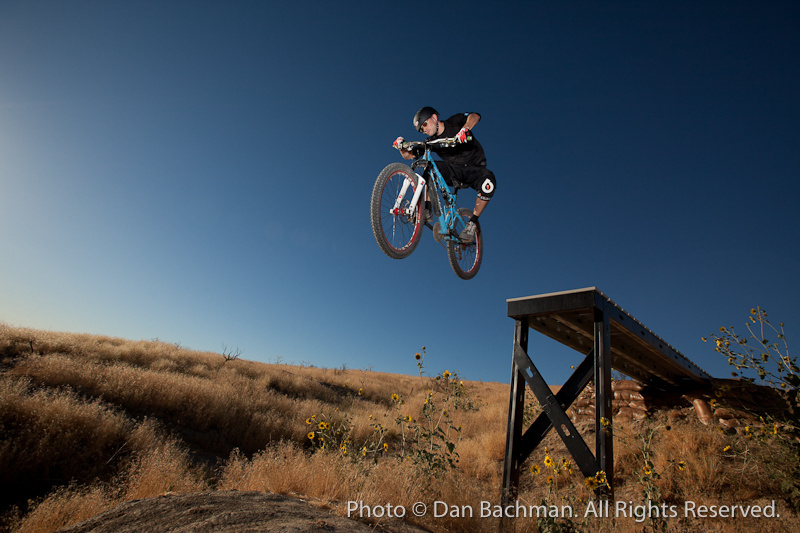 In the past some of the kids (and even a few of the adults) have raced BMX and mountain biked at EBP. They were looking for a community service project and this fit perfectly. 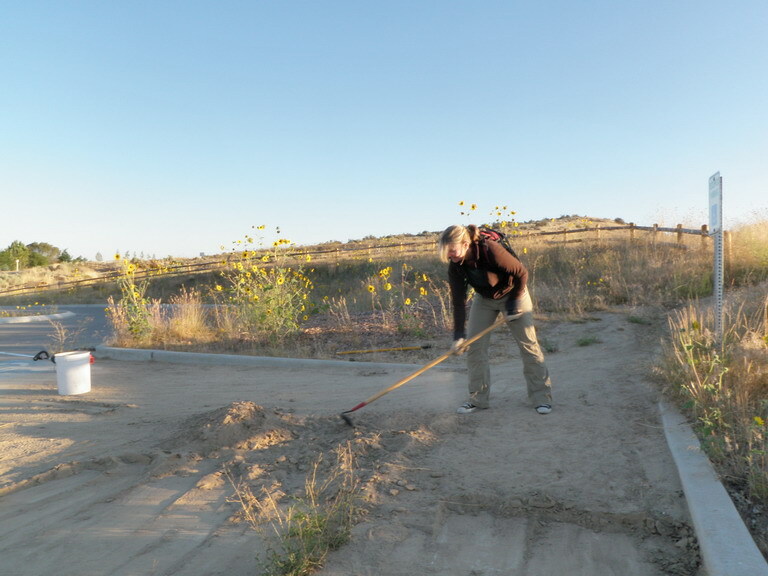 They worked for only a few hours but were successful in clearing weeds off much of the BMX track and weed wacked along a few of the mountain bike tracks. Ed Newgen was gracious enough to provide cold bottled water which was much appreciated as it was very hot and dusty as you can imagine. The group consisted of 9 adults running weed wackers and about 30 high school kids. Here’s a group pic sporting their Ephesians 6:6-7 shirts. (Scripture reads, “Not with eyeservice, as menpleasers; but as the servants of Christ, doing the will of God from the heart; with good will doing service, as to the Lord, and not to men”). 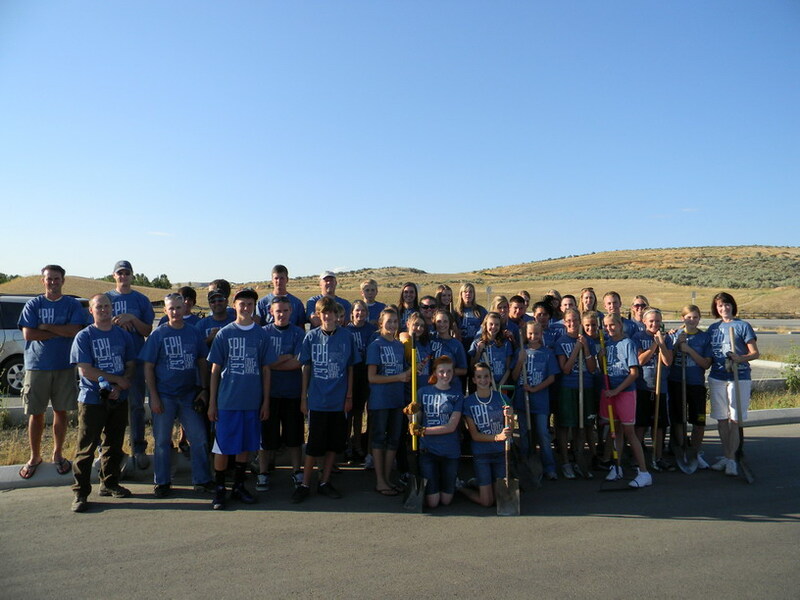 Sept. 4th, Pastor Ed from Eagle Nazarene Church brought over 100 people to clean the park, repair some trails and they did an amazing job. The park looks great! Here are some after shots…. We owe them a huge thank you! 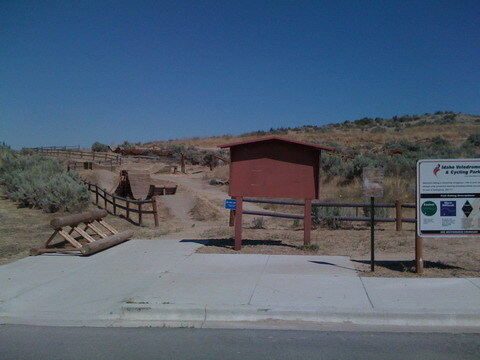 10/8 – Bogus – Boise EastSide ride to stack rock.